The Gemini Granular preemergent herbicide features ICL’s R-50 Optimizer, which is designed to provide a wider and more effective protective barrier in landscape beds. 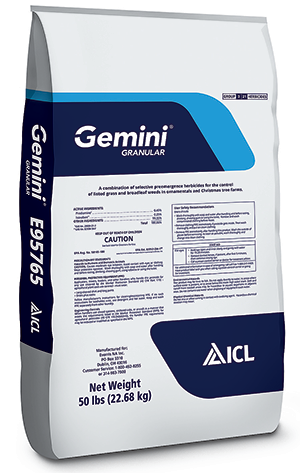 Gemini Granular with R-50 Optimizer controls more than 120 grassy and broadleaf weeds for up to four months. The preemergent herbicide has a low risk of phytotoxicity with more than 450 tolerant ornamental species. Toro added to its Precision Rotating Nozzle (PRN) line with the Shrub & Slope Kit, which includes a preassembled nozzle, shrub riser and check valve. The nozzle, available with a full or adjustable arc pattern, delivers low-trajectory streams at a matched precipitation rate of 0.6 in. per hour. The kit also includes Toro’s X-Flow Technology built into the riser. The X-Flow feature automatically prevents water from flowing through the riser when the nozzle is removed intentionally or through accidental damage.